Back in March, there was a week that my husband went out & left me home alone with a teething, sick, cranky, crying baby so many times that he felt guilty. He felt so bad that he decided I needed a night out to have fun, and he would stay home with the sleepless terror. While I really appreciated the sentiment, and thought it would be fun to go out with the girls, I knew I just couldn’t do it. After such a long week, nothing sounded better to me than a long, hot shower, enough time to myself to finish a cup of tea while it was still hot, and some totally un-interrupted sewing time. I wanted to go to bed early as well – but no matter how often I say that I will do it, that never seems to happen. Oh and leggings. I definitely wanted to be wearing some comfy leggings. Leaving the house for a girl’s night usually involves public-appropriate clothing, and in my world leggings are not public-appropriate. In the end I negotiated the chance to stay home and do all of those things – but really, I was most excited for the un-interrupted sewing time. I had a ton of projects started that really should have been wrapped up (including some paid ones! ), but with an opportunity like this, I really just wanted to relax & sew for fun. I had been stalking my regular sewing & pattern Facebook pages (see a list of my favourites here) and noticed that there is a free pattern on Made for Mermaids for a mermaid tail blanket! Of course there’s no adult version, but then I wondered why not – what self-respecting adult wouldn’t love a mermaid tail blanket?! More than anyone I know, my sister would want this! So I did what had to be done, and hacked the pattern to made it adult-sized. I used a thick sweater knit, so it would be both cozy and warm, and I tested the finished project for myself to make sure. Well, and to snap a picture of it, if I’m being honest. After wearing it for about 2 minutes, I realised that light pink is actually less mermaid and more salmon than I was hoping for. 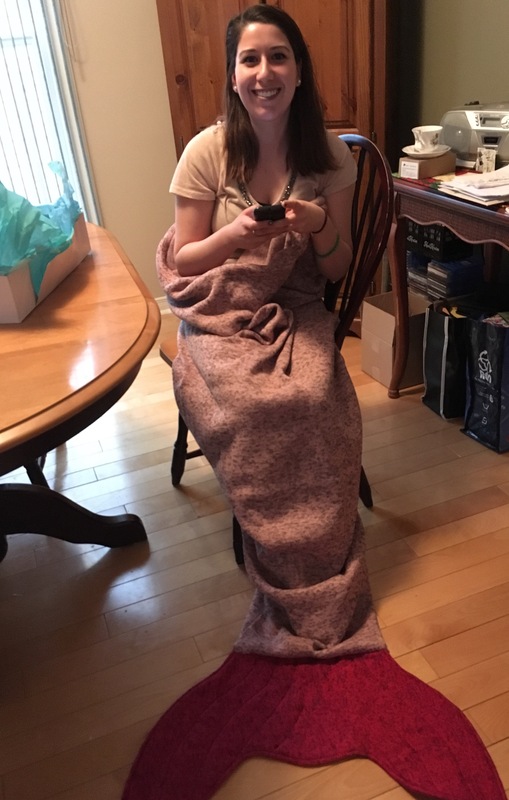 Everyone who’s seen the pictures has been kind & said it looks more mermaid-ish, but the reality is this: I made my sister a fish blanket for her birthday! BAHAHAHA!!!! Because I finished late at night I wasn’t able to get any really great shots, but I’m hoping that when she gets it, my sister will be willing to model it for a mini photoshoot. When she opened it up she put it on right away, because: mermaid tail! Of course that means she had to text pics to make her friends jealous, so I snapped this one. And didn’t tell her it would be posted here. EEEEEK I LOVE YOU!! !